Another year rounds up to an end. Dear clothing business owners, are you listening? The apparel industry in itself rode on a roller-coaster this year, seeing trends and changes in heaps. Hopefully, even with high market competition and highly demanding customers, you have managed to make the most of 2018. Time now to look forward to 2019! Knitwear polo t-shirts– Knitwear polo t-shirts are making the most noise this winter, and they are going to continue with their charm through first few months of the next year. Formal and with refined touch, they vouch a cleaner and suave appearance to the wearers. Turtlenecks– Turtlenecks are back in the scene and they are doing great with men who dig relaxed and smart look without much of an effort. The standard black and white ones are great for any formal occasion, while the bold variations are decent to rock an eye-catchy look on the streets. Denim joggers– Men’s cotton joggers, undoubtedly, dominated the whole of 2018. And their denim varieties have already made a major mark this fall. Perfect for daily wear, the denim joggers are simply amazing that gets along with any overall and every occasion. Plain T-shirts– Even after all these years – and amid all the hullabaloo of graphic-rich tees – plain T-shirts have still managed to keep their position as most demanded. 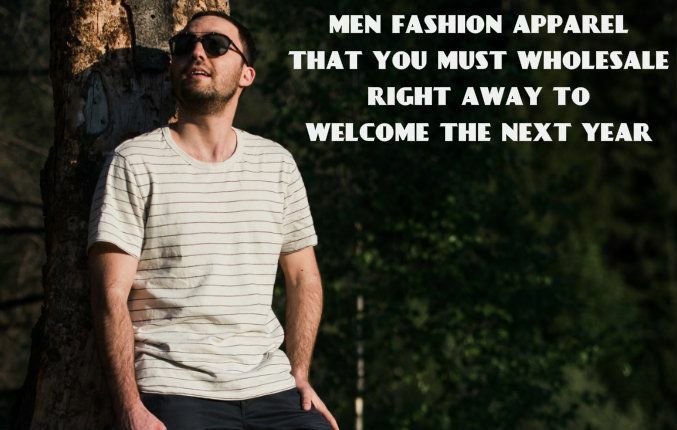 Offering a sweet, simple and go-to appearance, plus they layer-up well, if you don’t already have them in your warehouse, dial a good men fashion clothing manufacturer right away. Everything stripes– No more are stripes reserved for the ladies. From t-shirts, polos and even coats to trousers, joggers, shorts and capris, men’s striped apparels are doing great this season. In fact, all-stripped appearance, showcased in several fashion events, already highlights a large following. And they are going to take over the scene in 2019 too. These are 5 men fashion apparel items that are going to hit all the right notes in 2019. Be a smart business owner, wholesale them well in advance, edge the competitors and offer customers a top-notch experience. Contact a renowned custom men fashion clothing manufacturer today.